The A-PDF FlipBook Maker solution help you to create fabulous digital page flipping publication from PDF on both Windows and Mac OS. FlipBook Creator Pro for Mac is specially for Mac user, with this tool you are able to build flip book project on your Mac PC. And this tutorial is going to show you have to publish your flipping magazine step by step. Step 1 : Launch the FlipBook Creator Pro for Mac and start a new project. Step 2 : Click the “Import PDF” icon to open the PDF file you want to convert. 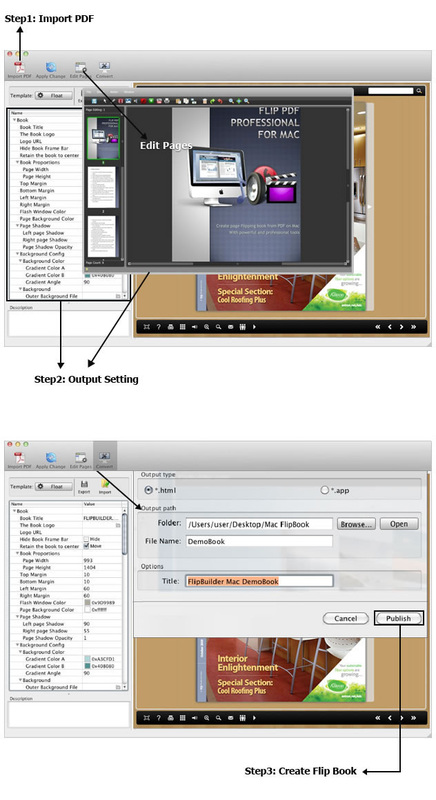 Step 3 : Design the flipbook style and appearance, even edit pages in “Page Editor” with multimedia contents. Step 4 : Choose “Convert” icon to configure output setting( publish to html or app ), then click “Publish” to start converting.